How often do we tell ourselves that something shouldn’t be as it is? She shouldn’t have said that to me. He shouldn’t have done that to me. The reality is, she did say that, he did do that, and this is happening. Resisting reality creates additional stress and anxiety. Resistance slows our progress towards finding a positive response and changing the outcome. Our thoughts often magnify the events that stress us out. She said that once. How many more times do we hear it in our thoughts? He did that once. How many more times do we see it over in our thoughts? It happened once. How many more times do we experience it in our thoughts? Be like The Beatles and “Let It Be”. This doesn’t mean that we should become complacent and allow injustice to prevail. We should take purposeful action to transform the present reality into something new. My work commute is about 30 minutes one way. I normally encounter stop and go traffic. I used to get very frustrated with the traffic. I’d call the people in front of me names and constantly change lanes trying to find the fastest one. Yet, it wasn’t the traffic that stressed me out. It was my thoughts about the traffic that stressed me out. I was resisting reality. A couple of years ago I started listening to audio books during my commute. I didn’t realize it then, but my thoughts about the traffic started to change. Now, the traffic doesn’t bother me one bit. I don’t mind it because it allows me more time to listen to my audio book. I’m actually at peace parked on the highway listening to my audio book. I’m in no hurry. It still takes me about 30 minutes to get to work, but it’s 30 minutes that I really enjoy. My thoughts about reality changed and that in turn changed my reality. Reality is forever changing. 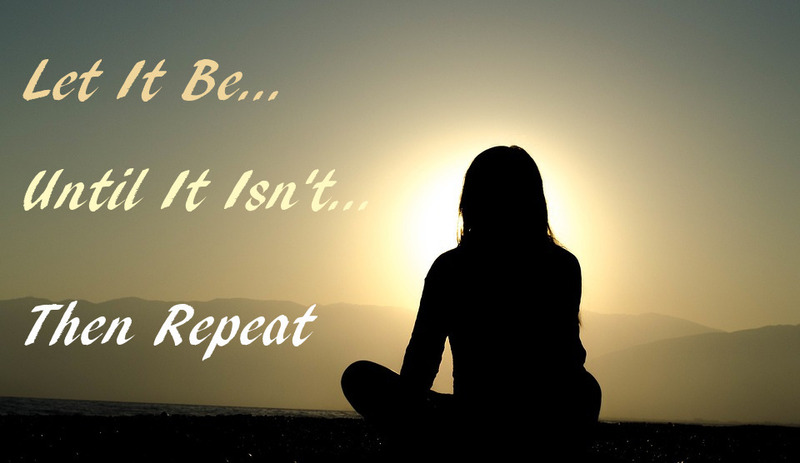 When stressed remember “Let It Be…Until It Isn’t…Then Repeat”. Don’t resist reality. Instead recognize that it is what it is. We should turn our focus towards a positive response to what is. Changing from resistance to surrender and positive response will eventually change reality. All we have to do is repeat the process. We will see challenges if we resist or opportunities if we surrender. Imagine that we find ourselves in the middle of a river with no one to rescue us. Swimming upstream towards the shore will quickly tire us. This is challenging because we are resisting the current. Swimming with the current towards the shore we use the power of the river. This is an opportunity that will bring about a positive outcome with less effort. Don’t resist reality. Reality will always win. What stresses you out? How might you change your thoughts about it? Can you let it be…until it isn’t…then repeat? “Free Image on Pixabay – Sunset, Dusk, Silhouette, Shadow.” Pixabay. Accessed February 11, 2017. https://pixabay.com/en/sunset-dusk-silhouette-shadow-girl-691848/. “Lao Tzu Quotes.” BrainyQuote. Accessed February 11, 2017. https://www.brainyquote.com/quotes/quotes/l/laotzu151126.html.